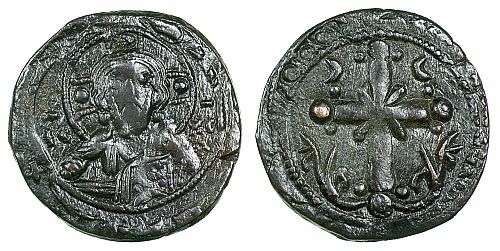 Around the year 830, the Emperor Theophilos (829-842) reformed the Byzantine coinage again, removing the now redundant denominational marks, which, while relevant in the sixth and early seventh centuries, had been reduced simply to the follis by the early ninth century. It was replaced with the epigraphic message: +θЄOFILЄ AVʕOVSτЄ SV nICAS (Theophilos Augustus, you conquer). 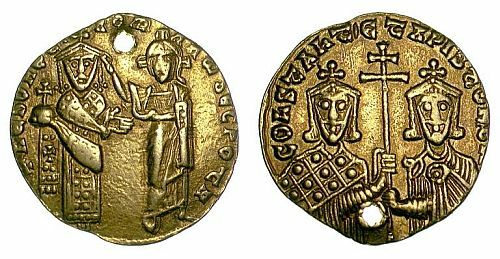 So begins what one might consider Middle Byzantine coinage, lasting until the reforms of Alexios I (1081-1118) in 1092, which rescued the gold coinage from debasement. Following the death of Theophilos in 842 and the Council of Constantinople in 843 (better known to us today as ‘the Triumph of Orthodoxy’), the image of Christ returned to the gold coins. While Christ’s image had briefly appeared under Justinian II (685-695 and 705-711), it had promptly disappeared following both his depositions and only very scarcely outside the capital during Justinian II’s two reigns. The reappearance sometime between 843 and 856 is unmistakably linked to contemporary political events, which supported the use of religious imagery, in contrast to the preceding years. Unlike at the dawn of the eighth century, however, Christ’s image became a staple of the Byzantine coinage from this point. During the regency of Romanos I Lekapenos (920-944) for Constantine VII Porphyrogennetos, Christ even appears performing the function of blessing Romanos’ regency (pictured on the coin in the header above). The Theotokos (Virgin Mary) also makes a first appearance on the Byzantine coinage in this period, specifically during the reign of Leo VI (886-912). Three of the most characteristic features of the coinage of this period, though, can be said to be the advent of concavity in the coins, the debasement of the gold coinage and the appearance of the anonymous folles. Nobody is entirely sure why the Byzantine Empire began to strike concave coins from the mid-eleventh century; suggestions include making them easier to stack, more difficult to forge, more structurally sound or just a demonstration of skill, as well as some more outlandish suggestions – that they make playing a form of tiddlywinks easier, or that they ‘jingle more pleasingly’! The extent of the concavity varies, however. The eleventh century Byzantine gold coinage also experienced noticeable debasement. In ancient, medieval and even early modern societies where coins were worth the metal that they were made of, the addition of silver, copper and other less valuable metals to the gold coinage made the gold coins themselves worth less than their nominal value, leading to inflation. Reversing this trend could be incredibly difficult, and in this instance didn’t occur until 1092. While coins were usually struck in the name of the ruler, or, in non-autocratic states, a representation of the state, in the late tenth and early eleventh centuries, the Byzantine Empire produced a large number of base metal coins known as anonymous folles, as they were not struck in the name of the emperor. These coins used religious, not imperial imagery, and appear to have circulated across the Empire. 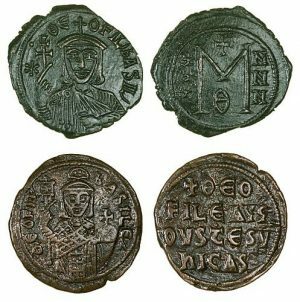 By working out which anonymous follis types were struck over which, scholars have attempted to establish a chronology for these, though some may have been contemporaneous but from different mints.